It’s never quite the same, is it? At home, you have all your bottles and brushes and jars and cloths and whatever else you need within easy reach. You can take care of your skin like you should, with some products for morning, others at night, and still others for midday refreshers. Everything works like it should, because you know how your skin acts at home. You know the climate and how your skin reacts to it, and when it needs a little more moisture or a serious oil-sopping mask. Your skin thrives with your TLC, and you look decades younger than your real age. But then, you decide to travel. You just have to go on vacation, don’t you? And your skin is not happy! Suddenly you suffer from excess oiliness, or maybe your skin dries up like a prune, exacerbating every single wrinkle and fine line you ever thought you had. Instead of looking vibrant and youthful, you looked dull, tired, and old. All this, when you had to make that important presentation, show up at your high school reunion, or impress the in-laws. Does it always have to be this way? Is travel skin automatically worse skin, or is there a magic way to keep everything on an even keel? Your schedule – usually traveling means you wake up and go to sleep at different times, throwing off your usual skin care routine. The climate – wherever you end up, the climate is usually mildly to severely different from your home base. Skin may have to adjust to higher or lower humidity levels, differing levels of sunlight, different temperatures, and more. The lodging – your skin may be subjected to increased dryness caused by air conditioning or heating systems. Your products – you may have cut back on the products you usually use because you needed to pack economically, which means your skin may go without something it has become used to receiving. Your stress levels – usually travel involves at least some stress as you work to catch flights or manage a road trip. Stress directly affects your physiology, which can show up in your skin. Your diet – whereas your skin is used to you chomping down on several fruits and veggies every day, your travel plans may interrupt your usual diet, forcing your skin to adapt to whatever you’re eating. Considering these factors and more, it’s no wonder your skin may struggle. 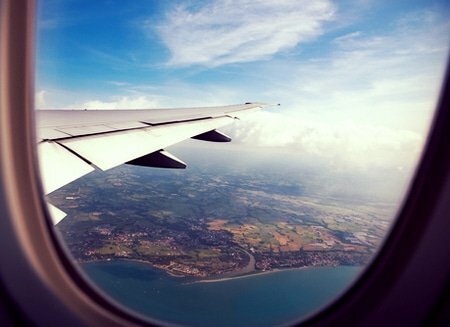 If you’re flying on a plane, you can pretty much count on your skin becoming dehydrated. If you have oily skin, it may react by producing more oil to try to keep itself moisturized, which can increase the risk of clogged pores. Even if you drive instead of fly, you can expect some changes. How can you cope? When considering how to take care of your skin on the road, remember this: travel skin care needs to be different than home skin care. Because your skin faces a number of changes while you’re traveling, you have to accommodate it by slightly changing your routine, as well. With that in mind, here are ten tips to make your next vacation skin-friendly! Prepare beforehand. Think about the trip to come. Will you be on a plane? Going to a dry climate? Prepare your skin a few days beforehand. Exfoliate gently and apply a hydrating mask (like our Coconut Honey Mask). Even if you have oily skin, realize that the drying effects of travel may cause your skin to overreact. Exfoliate, and then apply a light moisturizer, such as our Herbal Facial Oil for Normal and Combination Skin. Make sure your skin is in good shape before you leave. Take extra care the first night. When you arrive at you destination, make skin care a high priority. Your skin is likely carrying environmental elements on the surface when you check into the hotel. As soon as you can, wash carefully, exfoliate to get rid of all the gunk accumulated from your travels, then apply some of your best moisturizer. And don’t forget the eye cream! Have you suffered from skin problems on vacation? Please share any tips you may have.